Up to 30 people have been arrested across Turkey in connection with an ongoing investigation into an alleged plot to topple the government. Those detained include a union leader as well as a number of army officers and special force police officers. Eighty-six people have been on trial since October, accused of an ultra-nationalist plot to stoke unrest and provoke the army to launch a coup. Critics say the ruling AK party is simply arresting its secular opponents. Around 30 people were detained in a separate wave of arrests earlier this month. Most of the latest suspects are from the special operations unit of the police, the BBC's Sarah Rainsford in Istanbul says. The unit was set up to fight against terror in the 1980s - and was mainly active against Kurdish separatists. Human rights groups have documented many unsolved murders and disappearances from that time, she adds. The unit's former leader, Ibrahim Shahin, was arrested earlier this month, and a map found at his house led police to a cache of weapons buried in a forest. The connection between Mr Shahin, his former colleagues and the alleged coup plot has not yet been made clear, our correspondent says. 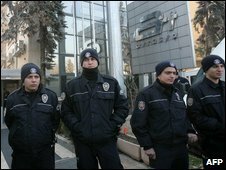 Among the others arrested was Mustafa Ozbek, chairman of the Turk Metal trade union. Police were also searching the private ART television station, a staunch opponent of the ruling party, the AFP news agency reports. Retired military officers, politicians, academics and journalists were among the 86 who went on trial in October, accused of being part of a shadowy group known as Ergenekon. The 2,455-page indictment in that case holds the group responsible for at least two violent attacks - the bombing of a secularist newspaper in 2006 and an attack on a court in the same year, in which a judge was killed. Attacks on those key parts of the secular establishment were supposed to provoke Turkey's military into launching a coup in defence of secular interests, it is alleged. The suspects deny the charges, saying they are politically motivated.